Rico Shacket has a distinctive look. A combination of city contemporary, mountain heritage and alpine technical, the Rico Shacket delivers warmth with performance and style that fits your urban landscape. Filled with lofty 750 fill power goose down and Coreloft® synthetic insulation in the shoulders, the Rico cuts the chill. The center front placket closes with hidden snaps, a shirt style collar anchors the style, and lightweight fleece panels on the sides streamline the fit. The Arato™ 30 nylon face fabric is lightweight and durable with a subtle texture. A DWR finish adds moisture resistance. Redesign includes the lightweight yet durable Arato™ 30 face fabric. Rico Shacket - Mens is rated 3.3 out of 5 by 4. Rated 4 out of 5 by eclectocrat from Wanted to love it. I really liked the warmth and style of this jacket and wanted to keep it. Unfortunately, despite the side panels, it fits a lot like a blazer, with tightness in the back when extending the arms. I buy technical gear because I can't stand the fit of blazers, so I returned the jacket. If the patterning is more like the Atom, and I could move the arms about without the blazer tightness, I'd wear this thing all the time. So very close Arcteryx! I would definitely buy again if next years version changes the patterning or adds some stretchy panels to the back. If you are used to blazers and they don't bother you, then this is a great jacket! Rated 2 out of 5 by johnp from Good looking jacket but not that durable... very great looking jacket and warm! I got a size small from Acrteryx store Toronto, im just 5'6 ft tall, fits a bit larger one me which is great because i can wear thicker sweater underneath for a much colder weather and be super comfortable. I was very happy with this jacket but had to return it couple of days after, because the outer material is not as durable as i thought it would for its price, it gets punctured quite easily and small down feathers seem to sneak out from stitches/thread holes now and then! will keep an eye for a version 2.0 of this jacket to purchase in the future! Rated 2 out of 5 by JamesW from Beware of shedding great looking and fitting jacket. lightweight and very comfortable. unique collar. A month after loving/wearing this jacket, which I bought at the store in Seattle, I noticed down popping through the shell constantly. At first it was just a feather every day or so, then it quickly became constant. I've owned several less expensive down jackets like this in recent years, but none have had the feathers come through the material like this. It sheds like the first down vests made in the early 80's. it's embarrassing to have people picking the feathers off you like a sick chicken. When I went back to the store to show to associates who sold it to me, they said they had had some complaints and suspected the down was coming our due to the all the stitching on the shacket. They told me they had similar complaints from other customers but acknowledged this was first season for this particular item. I still wear the jacket and its very comfortable, but for the price I paid, and the quality I've loved in other Arcteryx products, this one is really disappointing. Rated 5 out of 5 by Neil from Handy warm, casual but classy layer Just the right extra warmth layer for when it gets a bit cold or windy, in a relaxed but fashionable style. Rather than a zip, poppers make it so easy to pull on and off or open up when you get indoors, so handy when rushing around town and just as suitable on a brisk country walk, under a shell if the weather turns worse. 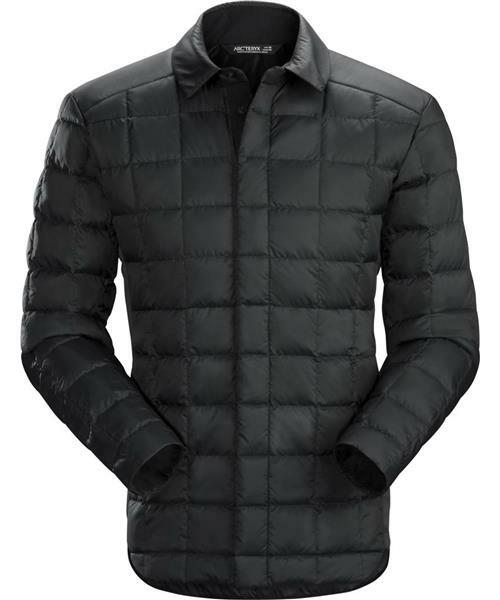 I've got other down jackets that are just as warm and practical, but this makes a distinct contemporary statement.